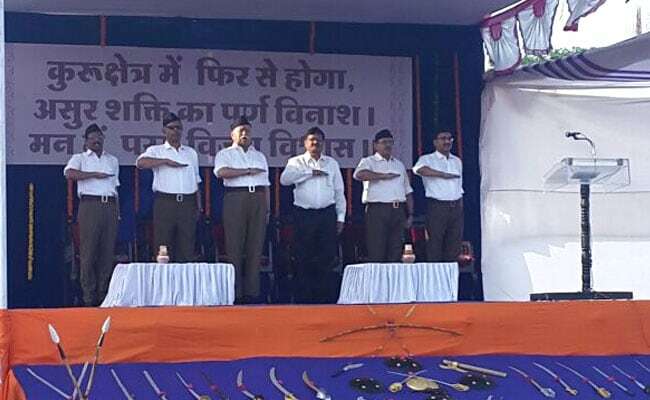 The RSS, defined by its Khaki shorts for over 90 years, switched to full pants on Dussehra today. With hands held to their chest in a pledge of allegiance, volunteers of the Rashtriya Swayamsevak Sangh or RSS cast away khaki shorts, their trademark attire for 90 years, and donned trousers today, heralding a generational change in the organisation which is the ruling BJP's ideological mentor. The transformation in the RSS uniform comes into effect today - Dussehra day, which is also the organisation's foundation day. 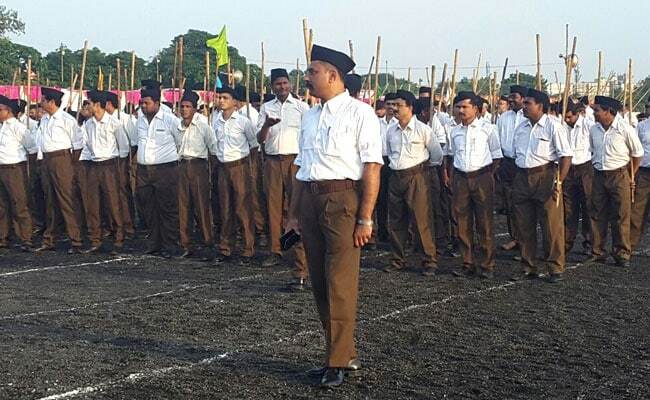 The RSS has also approved change in the colour of socks to be worn by its volunteers, replacing the old khaki with dark brown, to go with the brown trousers they would now wear, with white shirt and black cap. The traditional bamboo stick will, however, remain part of the uniform. Volunteers in the northern and eastern states, which witness harsh winter, will also wear dark brown sweaters. Orders for the first lot of one lakh such sweaters have already been placed. "Even though the readiness of society to work with Sangh on different issues has increased, the change in uniform has been made to take care of the comfort level and convenience while working. The transition heralds the change in Sangh in tune with the changing times," RSS' head of communications department Manmohan Vaidya said. The new attire was inducted at an event led by RSS chief Mohan Bhagwat. He said over 8 lakh trousers have been distributed, including 6 lakh stitched trousers, and cloth for another 2 lakh handed over to RSS offices in different parts of the country. Mr Vaidya said the change in uniform was mooted in 2009 but there was no forward movement. The proposal was revived in 2015. After discussions, RSS leaders and volunteers arrived at a consensus that the uniform needs to change. The All-India Pratinidhi Sabha ratified the decision. The sartorial transition marks an end to an era in the Sangh whose members have for decades been identified with the khaki shorts, inspired by the uniform worn by the British constabulary. The shift is rooted in the Sangh's desire to change by adopting a more convenient dress that is in tune with the changing times. "The issue of replacing the Sangh's age-old attire has long been under debate and its top decision-making body, the All-India Pratinidhi Sabha, approved the apparel a few months ago," said a senior Sangh leader. Another RSS leader Rajiv Tuli said the Sangh has been a flexible organisation which changes with the changing times. "Thus the change in attire," he said. The change in uniform is also being seen as driven by the Sangh's desire of attracting the younger generation to its fold.